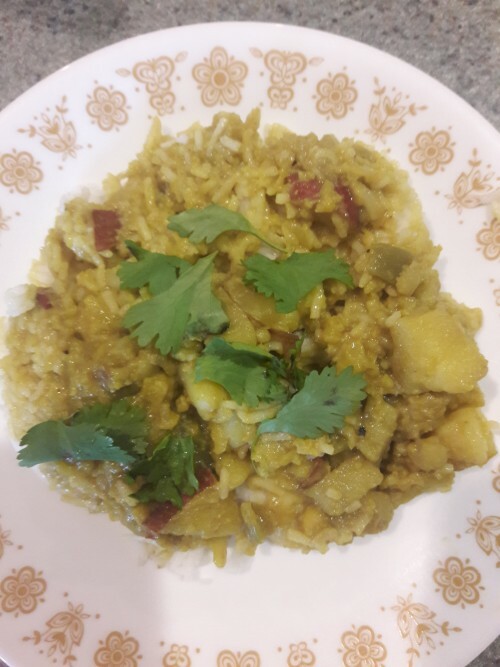 Summary: If you like Indian food, you’ll love this simple but elegant recipe! This dish has a delicate flavor yet is creamy, robust and filling for a cold winter’s evening. It is inexpensive and incredibly easy to prepare. You can serve it with either unpolished white rice (Basmati is best) or brown rice. The addition of turmeric and cumin imparts a nice spiciness to the flavor. We like our dish piquant, so we’re generous with spices. Adjust for your own taste. If you don’t have new potatoes, you can cut up red or even russet potatoes and use those instead. Truly a winner! If you like Indian food, you’ll love this simple but elegant recipe! This dish has a delicate flavor yet is creamy, robust and filling for a cold winter’s evening. It is inexpensive and incredibly easy to prepare. You can serve it with either unpolished white rice (Basmati is best) or brown rice. The addition of turmeric and cumin imparts a nice spiciness to the flavor. We like our dish piquant, so we’re generous with spices. Adjust for your own taste. If you don’t have new potatoes, you can cut up red or even russet potatoes and use those instead. Truly a winner! Pour olive oil into large saucepan and sauté onions until they are translucent and faintly brown around the edges (about 5 minutes). Add potatoes and water and cover. Simmer until potatoes begin to soften (about 10-15 minutes). Pour in coconut milk, cauliflower florets, turmeric and cumin. Cover pan again and continue to simmer until cauliflower is cooked through and mixture is thoroughly combined (about 15 minutes). Your kitchen will smell exotic! Prepare rice on stovetop or in rice cooker while your mixture simmers. Remove cauliflower/potato combo from stove and pour it over the rice. Toss a tiny amount of salt and pepper on top. Garnish with a bit of cilantro, crushed peanuts, and/or a dab of chili pepper flakes for extra pizzazz. Feel free to get creative with toppings! This dish pairs well with gluten-free naan (check label to make sure it doesn’t contain milk), paratha, or a small salad. You can also serve it with hot mint tea, vegan, gluten-free wine, or beer. Serves 4-5 hungry people with no trouble at all. If you do have leftovers, they will keep well in the refrigerator and taste even better the next day. We can personally vouch for the latter claim. Though this dish is not quite as exotic as a trip to India, we’re sure you’ll still love it. Enjoy! Read Next Article » Vegan New England Clam Chowder – Just in Time for Super Bowl!